Dr. Frederick Steiner is a highly respected voice in the field of landscape planning and architecture. He is the author of the book Human Ecology, which has just been published in its second edition. We asked him a few questions about it below. What is your definition of human ecology? Human ecology is the interrelationships among people and how we interact with our built and natural environments as well as with other species. In the preface of your book, you make note of the recent advancements “In the emerging fields of urban ecology, ecosystem services, resilience, and regenerative design.” How, 14 years after its original publication, is Human Ecology relevant in an era of climate change? Why is it important for humans to recognize and connect with the natural environments around them, including in urban environments where "pristine nature" does not exist? We need to understand that nature exists everywhere, including in urban environments, and to understand how natural processes work. For instance, take the hydrological cycle. Rain can fall on a roof or a parking lot or a tree or a lawn. If it falls on a roof, it might flow off to a hard surface or a vegetated one. If rain falls on a hard surface, it will not infiltrate into the ground and runs off rapidly, which can exacerbate flooding. If it falls on grass, it can soak into the ground and recharge aquifers. If it falls on any surface, it might evaporate or pick up pollutants as it flows downhill. Such knowledge can help us design buildings, landscapes, neighborhoods, and cities to ensure good supplies of clean water. Similar opportunities exist for understanding macro and micro climate, geology, soils, slope, vegetation, wildlife, and the built environment. In your book you state that now more than ever, we must ask ourselves what it means to be an urban species, and to be urban animals. What does it mean to you to be an "urban animal" and how has that perception evolved for you throughout your life? With more than half the world’s population now living in urban regions and more people moving to cities every day, clearly we have entered the Anthropocene Era, that is, the period of time when humans have had a measurable, even dominant, global impact on the Earth. I have witnessed this impact in many places as I have been fortunate to live in a great variety of locations—large cities, small towns, and rural regions in Ohio, Illinois, Washington D.C., Philadelphia, the Pacific Northwest, The Netherlands, Arizona, Rome, a few short stretches in Beijing, and Austin, Texas. I’ve also traveled to all 50 states and throughout North and Central America and Europe as well as to Brazil, Kenya, the Middle East, China, South Korea, and Australia. As a result, I’ve experienced a wide variety of human habitats and have been consistently impressed by the adaptability of our species. You say in your book that more and more people are coming to terms with the idea that "We are biological creatures who depend on the living landscape to sustain us." How do you feel that this cultural transformation will impact the future of man’s relationship with the natural world? I think we need to evolve from a species that exploits the natural environment to one that lives in partnership with nature. This would involve designing and planning our habitats to produce ecosystem services rather than depleting them. For instance, instead of eroding soils, we should be producing soils; instead of destroying wildlife habitat, we should be producing places for animals to prosper; instead of polluting air and water, we should be cleaning the air and water. Such partnerships should also include how we treat our fellow humans: peace should replace war, prosperity should replace poverty, and education should replace ignorance. You quote ecologist Paul Spears who said “If Ecology were taken seriously as an instrument for the long-run welfare of mankind [then it would] endanger the assumptions and practices accepted by modern societies, whatever their doctrinal commitments.'" What are some of these assumptions and practices that would be endangered? At the very least, we should rethink the roles of economics and engineering in our culture. Imagine a world where ecology and landscape architecture have equal standing and influence as economics and civil engineering. Along these lines, Pope Francis has taken a serious stab at challenging and changing the assumptions and practices of Christianity along the lines envisioned by Paul Sears. What are the benefits to the integrative study of human ecology, as opposed to the study of ecology and culture separately? How can we use this understanding to contribute to a future where both nature and people thrive? People are a part of nature, we have an ecology. Studying ecology without people or culture without ecology leads to incomplete understandings. Over half the world's population now lives in urban environments. What does this statistic mean to you? That we need to do a better job at living with nature to ensure that our species survives and thrives. 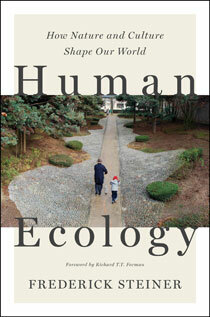 What do you hope readers take away from Human Ecology? That there is hope: we are a creative and resilient species. Fritz Steiner, author of Human Ecology, is the Dean of the School of Architecture, University of Texas at Austin.